Replacing the stock finder bracket with a sturdier version that can hold alignment. Lovely and clear but occasional drifting cloud coming and going. Very still, nil wind. Milky Way clearly visible despite nearby house lights. Still ok despite few weeks after hip op! Enjoying reliability of new electrical system. After aligning the tracking dob, I warmed up with M57 and M27, two lovely planetary nebulae, as my eyes gained full dark adaptation. 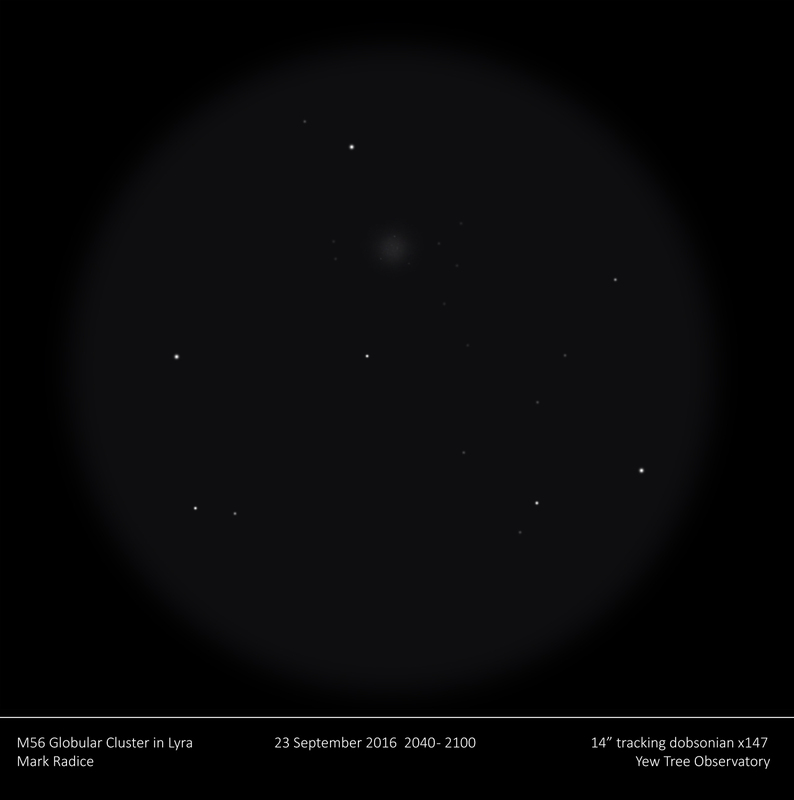 After M57 I sketched M56 as shown below. It was interesting to compare this smaller and fainter globular to the much brighter, and much larger, M15 (Peg) and M13 (Her). NGC6781 PN Aql Detected as a faint glow but the sky is starting to mist over. 2200 humidity rising, fainter stars gone, in fact no faint stars visible in Cygnus to the naked eye. My hip is aching and the eyepiece dew heater is struggling to keep up! Returned to NGC 6781. Very dim glow, circular, responds well to averted vision and contrast boost from UHC filter. Quite pretty and worth returning to. NGC 6934 GC Del Bright and dense, no granularity or bright stars, almost like an elliptical galaxy. Finished on M27 before quickly packing up.